Caffeine is not only useful for improving athletes’ performance during training. According to a human study done at RMIT University in Bundoora, Australia, the stimulant also helps recovery after heavy physical exertion. When combined with carbohydrates, caffeine speeds up the glycogen production in tired muscles. Over a period of 4 hours the subjects ate 4 g carbohydrates/kg bodyweight in the form of bars, gels and sports drinks. On one occasion that’s all they got [CHO], and on the other occasion the subjects were given caffeine as well [CAF]. The subjects were given a total of 8 mg caffeine/kg bodyweight, and the dose was split into two. During the recovery period the researchers took biopsies from the subjects’ leg muscles. They saw that the caffeine speeded up the rate at which the muscle cells produced glycogen by as much as 66 percent. 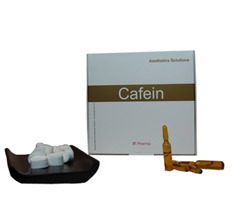 Caffeine raised the concentration of insulin and – to a lesser extent – glucose in the subjects’ blood. Endurance efforts cause an increase in the activity of the enzymes AMPK and CaMK in the muscle cells. Both these enzymes are involved in the process by which muscle cells take up energy. Caffeine increased the CaMK activation. The researchers think that AMPK may also play a part in this effect. From other studies they conclude that they may have looked at the wrong AMPK variant.